We are announcing our new Feature! We are now pushing a notification for ongoing season update using Telegram. 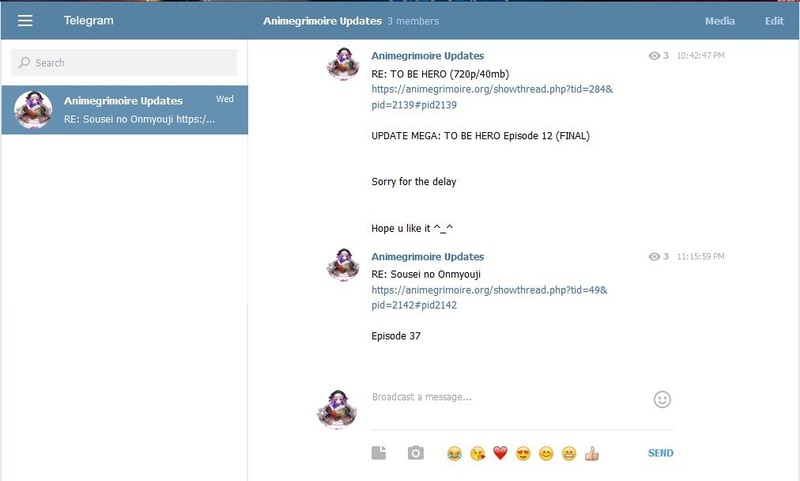 Head to https://telegram.me/Animegrimoire to subscribe. Kudos for Legendary Aurora to make this feature available! (31 December 2016, 07:28 PM)Atlas Wrote: hmm.. where is everyone? on vacation? this is new year after all. (31 December 2016, 07:28 PM)Atlas Wrote: maybe I'll take Seiren. I would used my old method, sharing batch/folder first. If taken down then I would share single links and reup to mediafire as batch. Won't reupload to mega as batch though if taken down.